Deleting blog comments mistakenly will happen for most peoples and this issue mainly occurs to folks who have their blog on Blogger. Just a few days back one of visitor asked us how to retrieve deleted comments in Blogger. Just like wordpress, Blogger don’t have any spam protection tool. When trying to delete spam comments, she accidentally deleted some published comments. So we suggested restoring the blog backup, but the good part is that in recent times she hasn’t done a blog backup. Backup is more essential and you need to backup your blog at least once in a week. Backing up your Blogger blog is simple, learn how to backup Blogger blog and restore them. If you have deleted any approved comments or posts then you can easily restore it from you backup. Anyways how about your recently deleted comments that is not included in the backup. By using email trick you can retrieve all the latest blog comments that you have deleted. Let’s see how to do this. If you have entered your email address on comment moderation settings, then you will receive mail for each new comment just like this. The email notification includes the commenter name, commenter URL, commented post, comment and the date of comment. To activate this feature go to your blog settings >> posts and comments and enter your email address in comment moderation. From now on you will receive email notification for each comment. To retrieve comments we are going to make a small change to your comment setting again. In your comment settings check “Anyone” (anonymous users) that is in “who can comment?” option and save settings. Now in your own blog you can post comments as an anonymous and that is even when you are logged in. Now it’s time to restore the deleted blog comments. All the comments are new and recently deleted one and so you can easily spot out all those deleted comments in your email. Open the post, click on post a comment and now you will have an option to add name / URL or post comment as an anonymous. Copy the commenter name, URL and paste it on right fields. Next copy the actual comment left by the commenter and paste it in comment box and publish it. If you have deleted all those email notification, then you have no more options. So keep all those comment notification as a backup for your blog comments. Retrieving comments one by one will take time and you can avoid this from frequent blog backups. So backup your Blogger blog regularly and keep your blogging stress away. Happy Blogging! 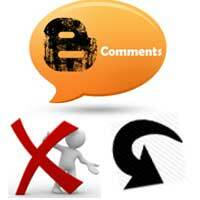 Hope this post helped you on how to retrieve deleted comments in Blogger. Share it and make your comments below. Also subscribe to our blog feeds, friend us on Facebook and circle us on Google Plus.